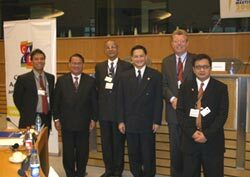 Liberal parliamentarians and party leaders from Asia and Europe convened for a two-day meeting at the European Parliament in Brussels on November 10 and 11, 2004 and affirmed their shared commitment to democracy, the rule of law, human rights and tolerance of diversity. The two-day high level conference was hosted by the Alliance of Liberals and Democrats for Europe (ALDE) and sponsored by the Friedrich-Naumann-Foundation. ALDE is the third largest political force in the European Parliament. Nearly 40 Asian parliamentarians and party leaders associated with the Council of Asian Liberals and Democrats (CALD) joined their European colleagues for discussions on recent political, economic and social trends in Asia and Europe. They also tackled globalization issues, multilateral cooperation as well as enhanced cooperation between CALD and ALDE. Mr. Watson introduced the European Parliament which has elected members from 25 countries as a “powerful prototype of international democracy,” and called it a model for liberals everywhere. Mr. Lee’s call was seconded by a leading member of the beleaguered opposition party of Cambodia. “We cannot fight against our own dictators if we do not have the solidarity of the European Liberals and Democrats,” said Ms. Saumura Tioulong, member of parliament for the Sam Rainsy Party. Four senior members of the Liberal Party of the Philippines joined the CALD-delegation in Brussels. They were Secretary for Agrarian Reform Rene Villa, Senator Rodolfo Biazon as well as Congressmen Dr. Neric Acosta and Lorenzo Tanada III. Resident Representative Dr. Ronald Meinardus was also part of the delegation from Manila.